During our vets clinics we routinely assess your pets health and well-being, identify any underlying health issues, and formulate a plan of treatment. We can also answer any health or behaviour issues that you are concerned about. In addition we aim to keep your pet healthy by means of vaccination and parasite control. At Brannock Veterinary Clinic, Pamela and Laura are responsible for the smooth running of the surgery and for keeping owners informed of the medications dispensed. Both Pamela and Laura will carry out admit and discharge appointments where they will discuss your pets planned procedures and post op. They will be fully informed of the processes carried out so they can answer any questions on your pets’ aftercare fully. Occasionally samples are taken in the consulting room to be analysed in either our in-house lab or sent to an external lab. More often though, patients are admitted into the surgery. Before your pet is admitted into the surgery the nurse will go through a consent form and procedures with you and we will ask you for a contact number. It is extremely important that you provide us with a number on which you will be contactable for the duration of your pets stay as we may which to discuss any changes to your pets’ condition or changes needed to the planned procedures. Investigations commonly undertaken are x-rays, ultrasound, blood samples, biopsies and urine analysis. Routine operations that we carry out at Brannock are neutering of both male and females, tumour removals, dental procedures, stitching wounds, treating eye ulceration and more occasionally removal of foreign bodies, tail tip or digit amputations. Any operations that require specialist attention or equipment would be referred to a suitable specialist. Brannock Veterinary Clinic does not offer any form of credit and so all accounts are payable at the time of consultation or surgery. Payment methods that are acceptable are cash and card transactions. 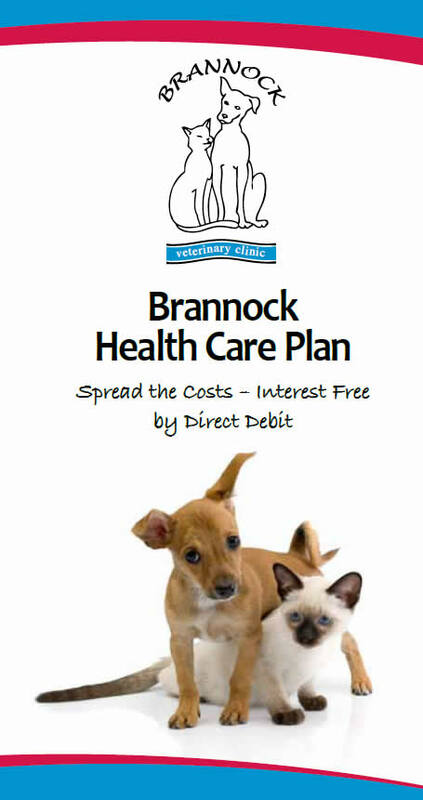 Routine healthcare such as vaccinations, worming and flea control can be budgeted for using Brannock’s HealthCare plan. We fully appreciate that there can be unexpected financial burdens if your pet has an accident or becomes unwell and we advise insurance for your pet to ease this burden. Unpaid accounts will be referred to our debt collection agency and further charges will be levied in respect of the costs incurred in collecting the debt . This action may affect your future credit rating. We at Brannock Veterinary Clinic, strongly recommend that your pet is protected by health insurance. Accidents and ill health are by their very nature unpredictable and at this emotional time it is reassuring that if they are covered by health insurance the financial aspect is not an additional burden. There are many insurance companies offering pet health insurance. It is up to you as the owner to research all the options available and make an informed choice as to what policy will best meet your needs. It is very important to read all of the small print carefully because when you claim the small print can become very important. The staff in the surgery are more than willing to discuss this further with you but they cannot recommend a specific company. As with any insurance policy, you will have to make monthly payments direct to the insurance company whether you claim or not. This is termed the insurance premium. In the event of a claim each policy will have a set amount as an excess. These figures will vary company to company but will be detailed in your insurance schedule. Once this excess has been reached you will be entitled to reclaim any additional costs. In some cases, Brannock veterinary clinic will allow direct claims. This means that payments would be made by clients up to the value of the excess and on production of proof of current and adequate insurance cover Brannock vet clinic would claim all further costs direct. This would avoid you being out of pocket in cases of larger claims. It must be stressed that this is a privilege for our longstanding clients and is not a statutory right .Each case will be assessed on its own merits and the situation confirmed before treatment options are investigated. It is always possible that there will be shortfalls in the payment by the insurance companies or that the claim will be declined (non-payment of premiums, or a pre-existing condition, expired cover) and it is the responsibility of the policy holder to cover this deficit. Direct claims will not be undertaken if, in our opinion, it is unlikely to be covered by your policy. Submitting a claim does not guarantee that it will be paid and any shortfalls or non payment of a claim must be covered by the owner. A good quality of life is paramount for our pets and if we are reaching a stage where medication or surgery cannot make life more tolerable then euthanasia must be considered. Reaching a decision whereby euthanasia may be the kindest option is a very difficult journey and we will always be there to support you in any way that we can. At Brannock Veterinary Clinic, we will always try to arrange a euthanasia appointment at a quiet time in the surgery, out-with normal consulting hours. This allows us to give you and your pet our undivided attention and to minimise any delays on your arrival at the surgery. You are more than welcome to stay with your pet. In most cases we will place a catheter to allow us access to a vein to make the administration of the injection as smooth and pain free as possible but if your pet is very agitated we may suggest administering a sedative prior to the injection. On giving the injection an overwhelming feeling of tiredness is all that our beloved pets feel as they slip away. We can arrange cremation on your behalf using The Pet Crematorium based in Livingstone either on a routine basis or with individual ashes back.